Our Open Houses Tour the Friday before the LA Lit Show at the Hilton Hotel started with a visit at the Pelican Parts Headquarts in Harbor City. It was the first time Wayne Dempsey, owner of Pelican Parts opened his premises and garages to the public, in association with the grand event on Saturday. We arrived early, actually the doors weren’t even officialy opened. Nevertheless we walked through the gates. Outside, some external vendors were preparing their booths to present their parts and stuff to the audience. We walked into the garage, as we wanted to see the treasures that we knew were in. OMG was that worth the visit. 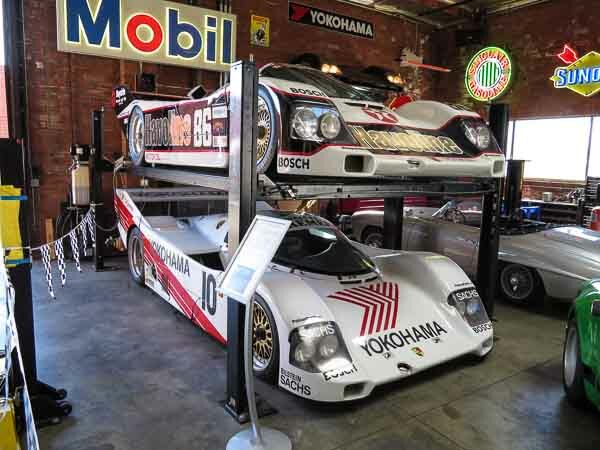 The garage that is filled with some great Porsches is exactly what a man cave should look like. One of the first car you could see was Porsche 962-121, the 1987 Sebring 12H Winner(Jochen Mass / Bobby Rahal) and 1988 Sebring 12H Winner (Hans-Joachim Stuck / Klaus Ludwig). This car raced it’s entire career in the USA, int he IMSA GT Championship. The Jägermeister livery Porsche 962-138 ran 2 WSCC rounds in the 1988 season : in Spa-Francorchamps in Belgium where it finished in 8th position. Later that year it ran another round at Sundown Park in Australia, with a 6th place as a result. In the 1989 season the car was very active with at least 8 more entries in the World Championship, however without being very succesful. The last car that Peter Gregg , owner at that time of Brumos Porsche in Jacksonville, raced found a new home in the Pelican Parts garage too. Peter Gregg experienced vision issues as a result of a bad crash that same year in France when he was on it’s way to qualifying sessions for the Le Mans 24H. This vision issues were the main reason for Peter Gregg not to qualify at the 1980 250 Miles of Daytona Finale. Later it turned out this would be Peter Gregg’s very last race. The car was sold to the Bayside Disposal Racing team and continued it’s life on the track driven by pilots like Al Holbert and multiple Daytona 24H winner Hurley Haywood. As if that’s not enough, in between the Jägermeister Porsche 962 and the Brumos Porsche 935, you could admire a 1987 Porsche 959 that was accompanied by a Porsche powered 2000 Lola B2K/10. This was my first visit to Pelican Parts, and will definitely come back next year. At least, I hope they will have Open House again.